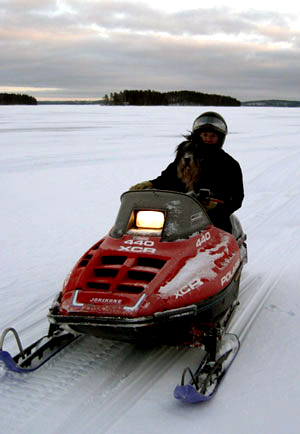 Christina's Kingi(Flinkbein Srebro) enjoying a ride in Finland. Pour 6 ounces of isopropyl alcohol in to a plastic applicator bottle. Add 1/2 tablespoon of boric acid powder. Add 2 ounces of white vinegar. Shake the solution extremely well, until the boric acid powder is fully dissolved. shake it up some more. Squirt the solution inside your dog's ear until the ear canal is completely full. Massage the outside of the ear to help slosh the cleaning solution around inside. Hold the dog still for about a minute. Be sure to shake the solution up really well before each and every time you use it. The boric acid has a tendency to settle at the bottom of the bottle. Use the cleaning solution daily until you start to see some improvement. Gradually cut back to once per week when you are happy with the condition of the ear. When the ear seems completely free of infection, you can go two weeks between treatments.